We've collected some interesting facts about Bolivia, and can also offer you a small collection of worksheets and a full set of flag printables and flag colouring page to help your studies! 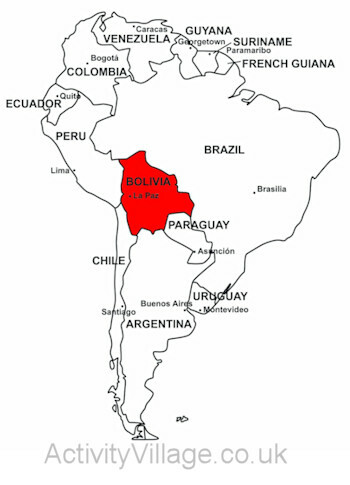 Bolivia is a large landlocked country in central South America, surrounded by Brazil, Peru, Paraguay, Chile and Argentina. Bolivia has three main zones: the high Altiplano plains and Cordillera mountains in the west, the Yungas semi tropical valleys on the slopes and savannah and tropical lowlands to the east. Bolivia has no beaches. It lost its former coastal region, the Litoral, to Chile during the Saltpeter War. Sucre, a World Heritage Site, became the official capital city in 2009. It is known as the city of four names as it was formally called Charcas, La Plata and Chuquisaca. Bolivia has the second largest natural gas reserves in South America, after Venezuela. Bolivia is named after the national hero Simon Bolivar who fought Spanish colonialism to create an independent Bolivia in 1825. The Andean region of Bolivia was part of Upper Peru for nearly 300 years, dating from when the Spanish conquistadors conquered the Incas until independence in 1825. President Evo Morales, a former llama herder when young, introduced a new constitution in 2009 to help indigenous people. Around 60% of the 10.5 million population are indigenous people, the highest percentage of any South American country. Spanish is the official language. Officials must also be able to use another one of 36 indigenous languages including Quechua and Amayra. La Paz is the third largest city and centre of government and business. It sits in a gorge a mere 3,600 metres above sea level. El Alto airport, 400 metres above La Paz on the altiplano, is the highest in the world. 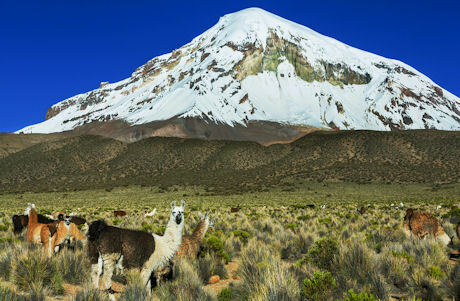 Visitors can suffer from ‘soroche' or altitude sickness. The Mercado de Hechiceria or Witchcraft Market in La Paz sells herbal cures, magic charms and dried frogs! You might want to avoid the highway from La Paz to Coroico, which is officially known at The Most Dangerous Road in the World! Each year dozens of vehicles fall off the road which descends 3.5 km metres from the mountains. The Salar de Uyuni is the largest and highest salt lake in the world, spreading over 12,000 sq km. Uyuni has a Salt Hotel made of salt bricks and three types of flamingo living on its edge. Tiwanaku is an ancient mountain city, pre-dating the Incas. The Akapana pyramid is built of stone blocks weighing up to 25 tonnes, which were dragged here from 40 km away. Potosi became the largest city in the Americas when the Spanish exploited silver from nearby Cerro Rico (Rich Mountain). Indians worked as slaves in the mines and died in huge numbers whilst the King of Spain received 20% of all the wealth. Bolivia on map of South America. We have a printable version here. Bolivia is one of the world’s poorest countries, with almost 50% of people living on less than $2 a day. It has the highest rate of infant mortality in South America. 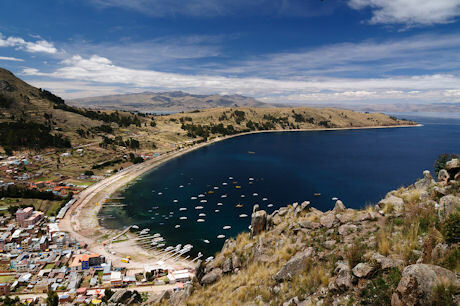 Lake Titicaca on the border with Peru is the spiritual home of the Incas, who believed that the sun and moon emerged from a cave on the Isla del Sol. The freshwater lake is larger than Costa Rica and over 100m deep. Most indigenous Bolivian woman wear bright traditional clothes such as colourful ponchos, ruffled skirts and bowler hats, which vary from region to region. Have you heard of an animal called a vicuna? Vicunas are the smallest camelid, similar to alpacas. They live in the high Andes. Their fine wool was prized by the Incas. Numbers in Bolivia are recovering after near extinction in the 1970’s. Butch Cassidy and the Sundance Kid and Che Geuvara all met their ends in Bolivia!